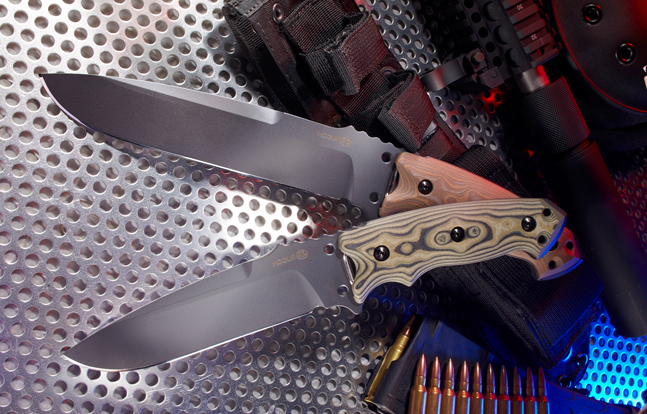 Designed by detail-driven Allen Elishewitz, this tactical fixed knife is built for real-world survival! Believe your eyes! Hogue’s Allen Elishewitz-designed EX-F01s are about as close to custom as can be, less the custom-made price points. The EX-F01s are in the sub-$250 range. Navigating the world of knife design collaborations is difficult. Whether you are a pure designer or a custom maker crafting your own handmade blades, accurately translating your ideas into factory-made production knives is a challenge. Production methods and practicalities typically mean compromises. And compromises mean that the finished products are never exactly the way you want them to be. The Torx wrench stored in the handle allows easy removal of the handle scales, revealing storage compartments for survival necessities. Having played on both sides of this equation, I understand the compromise process. That’s why I am very impressed when I see knives that turn out exactly the way a designer intended them—especially when they accurately reflect the details of a knifemaker’s custom-quality work. One outstanding example of this “exception to the rules” is the Hogue EX-F01 Tactical Fixed Blade designed by Allen Elishewitz. 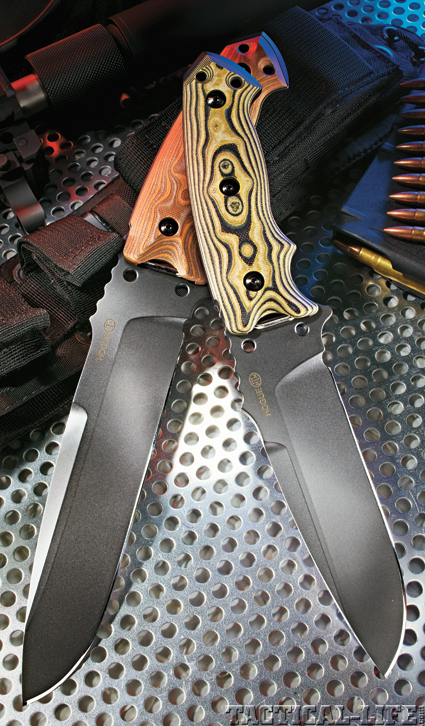 Regular readers of Tactical Knives already know that Elishewitz has partnered with Hogue, a leading manufacturer of handgun grips, to produce an outstanding series of tactical folding knives (see January 2011 TK). Based on the outstanding success of that project, Hogue has decided to follow up with a fixed-blade offering that they have designated the EX-F01. The unique swedge grind of the Elishewitz designs creates a diamond-shaped area that reinforces the point and the overall structure of the knife. 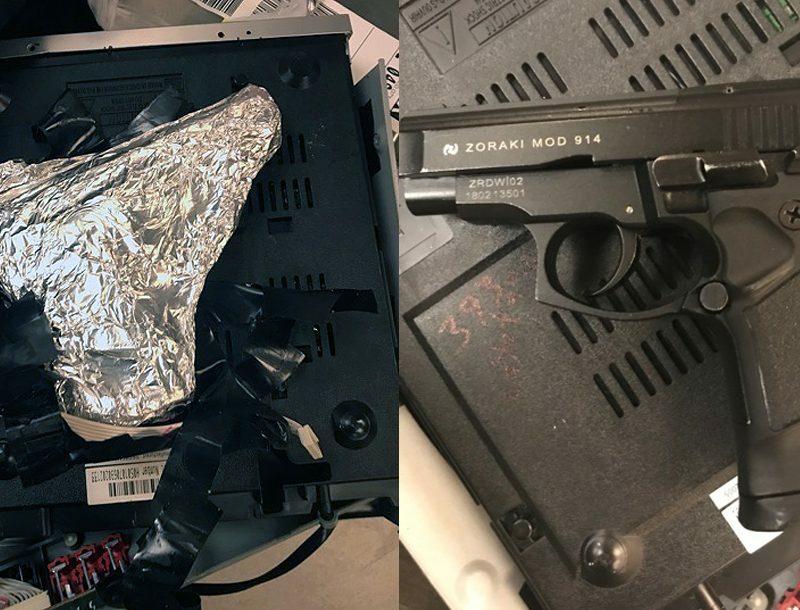 According to Elishewitz, he wanted his first Hogue fixed blade to be a high-performance, all-purpose tool appropriate for both military personnel and outdoorsmen. With this goal in mind, he started by choosing an appropriate steel: A2. An air-hardening tool steel renowned for its toughness, A2 offers an excellent balance of edge retention, strength and ductility, and is perfect for hard-use applications. For the EX-F01’s blade, Elishewitz specified a hardness of Rockwell 57-59 and cryogenic treatment to ensure toughness and ease of sharpening. For blade shape, Elishewitz chose a broad, drop-point profile that combines a strong, well-centered point with plenty of belly for skinning and related field chores. The EX-F01’s blade bevels are flat ground to provide a good balance of strength and edge geometry. Its primary cutting edge leading to the belly is long and straight for easy sharpening—even in the field. The EX-F01’s blade also features a unique swedge on the back of the blade. Unlike a typical swedge or false edge design where the bevels extend all the way to the point, its bevel runs parallel to the knife’s centerline to create a flat ridgeline between it and the primary bevel. This creates a thick diamond-shaped section at the tip that significantly enhances point strength while still reducing weight. It also functions like the ridgeline of a sword, strengthening the overall structure of the blade while reducing drag during cutting. In keeping with the focus on strength, the EX-F01 features skeletonized full-tang construction. Its handle scales are 3-D machined from Hogue’s proprietary “G-Mascus” material—a laminate that is similar to G10, but with a pronounced, multi-colored grain structure. This structure is created by using dies to press a pattern into the layers of the material before the epoxy cures. The result is a durable and visually striking material. The scales of the EX-F01’s handle are secured to its skeletonized tang by Torx screws. A Torx wrench is nested in a milled recess in the obverse-side handle to allow easy tightening or removal of the scales. The scales themselves feature milled pockets that align with the skeletonized cut-outs in the tang to create storage spaces for small survival gear—like fishhooks, fire starting materials and similar items. 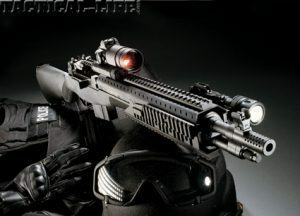 The tang of the EX-F01 terminates in a tapered “skull crusher,” which adds to its close-quarters-combat capabilities and offers a focused-impact tool for glass breaking and similar rescue functions. The fit and finish of the EX-F01 is outstanding and easily rivals the very best commercial knives on the market. Based on the list of features described above—and the extensive thought that Elishewitz put into each of them—it’s also clear that this knife is all about attention to detail. However, one of the things that most impressed me about this knife was the design of its sheath. Allen Elishewitz’ extensive field experience is clearly evident in the design of the Hogue sheath, which mounts to MOLLE, carries on the belt, and offers drop-leg carry. It’s one of the best commercial sheath designs the author has ever come across. My previous work in the knife industry included extensive experience with military-style aftermarket sheaths. Although I tried diligently to improve the industry-standard design to offer something better, I was consistently overruled. In simple terms, the EX-F01’s sheath is everything I ever hoped for and more. Drawing heavily from Elishewitz’ military experience, the EX-F01’s sheath design is the result of a three-month revision process and countless prototype revisions. 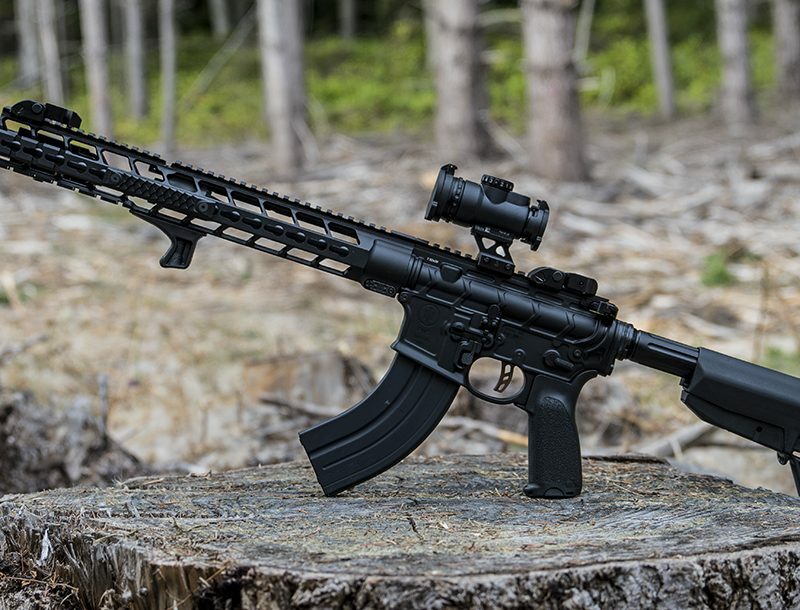 It is constructed of Mil-Spec black ballistics nylon and features MOLLE webbing on the outside surface. This webbing accepts an optional external pouch (available separately) that accommodates a folding knife, multi-tool, spare pistol magazine or flashlight. When used with the latter, a drain hole in the bottom of the pouch also restricts the output of the light to provide a perfect low-profile navigation or administrative light source. Unlike the cheap extruded plastic channels used in most aftermarket sheaths, the Hogue sheath’s insert is injection molded to actually fit the blade of the knife and eliminate rattling. Already better than the competition, this feature is actually being improved for enhanced retention to allow the knife to be carried handle up without a retention strap. If you want retention straps, the sheath includes not just one, but two—satisfying the requirements for use in airborne operations. The straps are not only removable but reversible to suit the user’s preference and prevent snagging regardless of where the sheath is mounted. 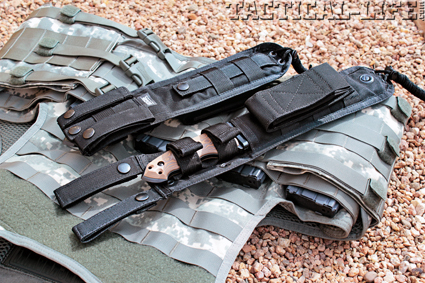 Speaking of mounting, the Hogue sheath not only features an integral Natick strap for attachment to any MOLLE platform, its split belt loops are also MOLLE compatible. 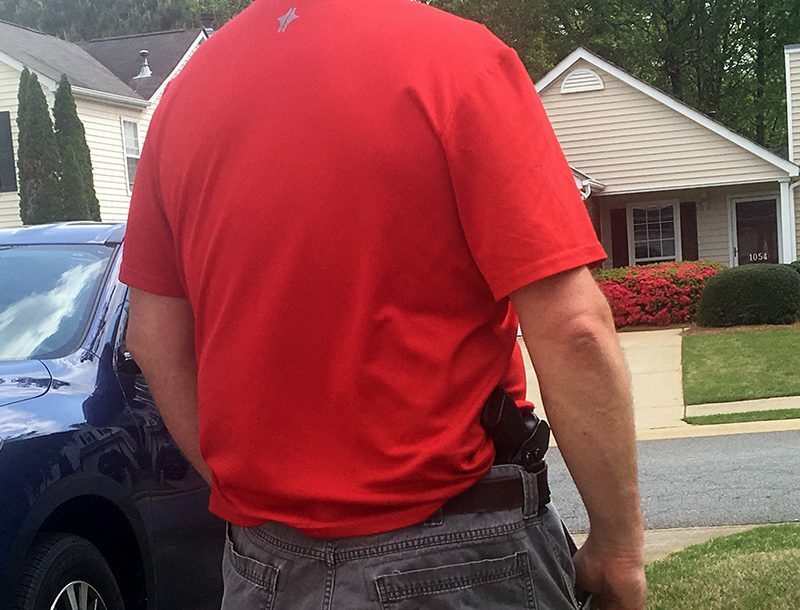 If that’s not enough, the belt loops can also be extended to allow drop-leg carry from the belt—a perfect solution for today’s troops to carry the knife below their body armor while reserving their vest’s MOLLE real estate for mag pouches and other high-priority items. A tie-down lanyard keeps the drop-leg carry from bouncing and also provides a source of parachute cord for survival applications, like securing the knife to a pole for use as a spear. How would you do that? By using the four strategically placed holes in the ricasso and tang that I forgot to mention above. Attention to detail? You bet. Even better, the Hogue sheath will be available separately as an aftermarket sheath for any comparably sized fixed-blade knife. 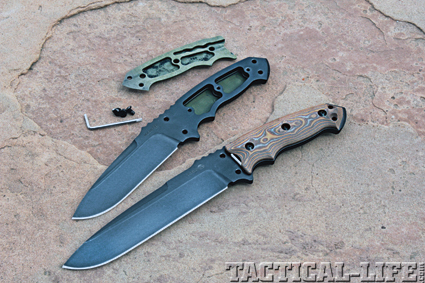 You may have already gathered that this is one of the most thoroughly thought-out knife designs ever produced. So how do all these features come together in actual use? Extremely well. A highly polished, hair-popping edge and outstanding edge geometry make the Hogue-Elishewitz knives outstanding cutters. My testing of the EX-F01 included a variety of typical cutting chores and other applications designed to simulate field use of this knife by its target audience. I began with detailed tasks like whittling fuzz sticks for fire making and food preparation. Its hair-popping, polished edge and excellent edge geometry make it a true high-performance cutter, while its balance and ergonomics allow precise control, even when butchering fatty cuts of meat. 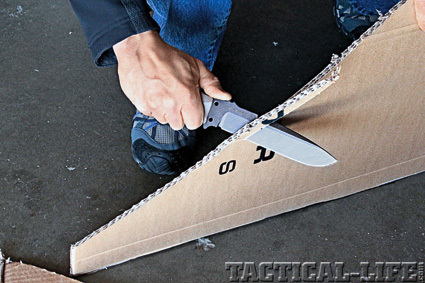 Cutting cardboard boxes to make 3-D range targets further tested the knife’s ability to cut with control and gave me a better idea of its edge geometry and retention. Other tests included cutting rope and cord, chopping through some seasoned silver maple branches and splitting kindling. The EX-F01 tackled them all with ease. I’m a firm believer that prying should be done with pry tools, but I also know that in the field you often have to make do with what you have. The EX-F01’s 0.235-inch-thick blade proved to be extremely tough in this regard, easily prying the slats off several wooden pallets with no ill effects on the knife or its Cerakote finish. Although I never actually succeeded in dulling the edge, I did touch it up on a ceramic stone before assessing its handling and performance as a fighting knife. Its excellent balance gave it a very “alive” feel and made it very quick in the hand. Both ballistic and pressure cuts produced deep lacerations in my test target. Thrusts with the broad blade produced large wound channels and better than expected depth of penetration for a blade with so much belly to the edge. Allen Elishewitz and Hogue most definitely got it right with the EX-F01. 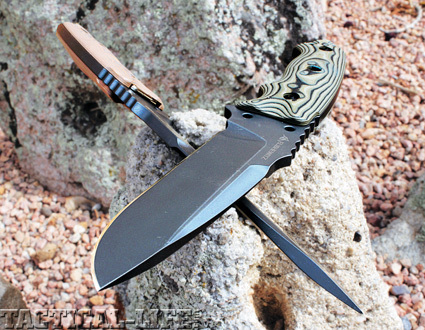 This outstanding knife is available with a 7-inch blade for military applications and a shorter 5.5-inch blade that is more suitable for survival use. In addition to the G-Mascus handles, Hogue plans to add injection-molded plastic handles with rubber inserts in the near future and presentation-grade hardwood handles as well. At suggested retail prices of $249.95 and $239.95, these knives offer exceptional quality and performance at very affordable prices. Hogueknives.com.